Dundee defender James McPake is targeting a return to full fitness for the start of next season. 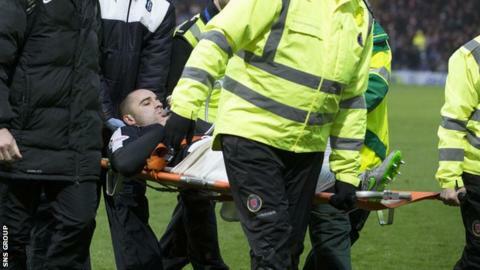 The 31-year-old fractured his left knee cap in three places during the Dundee derby against United in early January. McPake told BBC Scotland he knew almost immediately after the tackle on Tangerines midfielder John Rankin the injury was a bad one. "My knee was a bit displaced to say the least," Northern Ireland cap McPake told BBC Scotland. "I'd never seen anything like it before and that's when I got worried and got a bit of a fright. "I knew straight away I was going to be out for a long time. I knew I'd need an operation but the big worry was how the ligaments were. "I'd be lying if I said I wasn't worried about how I was going to get back but at no point did I think 'that's me finished'. "Thankfully, the scan was fine. The cruciate was a bit stretched but there was no rupture. It's still a horrible injury but it could have been a lot worse. "They've basically tied the three factures together with wire and put two screws in it. The screws will come and so will the wire, maybe after four months. "Hopefully, I'll be able to kick on from there." This will not be McPake's first extended period on the sidelines. "I never seem to get basic injuries," he explained. "I broke my leg when I was 17 playing for Livingston in the Youth Cup. 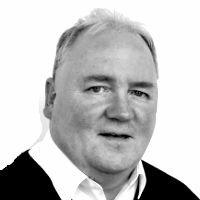 "I've had hernia stuff that most footballers get. I've had a few of them, that was easy. I dislocated my shoulder at Coventry, which was a horrible one. That was my most painful one until this. "Then my back happened, three fractures in the transfer processes. That was my first back surgery. "I came up on loan with Hibs and everything was fine, then I signed for Hibs and it started flaring up again and I needed a second operation. "They put in two small implants, which gives a bit more room for my nerves to get through. "Hand on heart, that's worked wonders because I've not missed a game with Dundee due to my back." And McPake made use of his times away from playing with a view to his future career. "When I broke my leg I went to night school and did my Higher English," he said. "I did my B licence [for coaching] at 27 when I had my first back injury. I'm doing the A course just now, started in the summer, working with the young lads. "I want to stay in football and that will be my next step." And though his rehabilitation "will be tough", the defender insists: "It's not going to stop me." "I love playing football that much," he added. "The rehab doesn't scare me. I've done it before and I know I need to work hard and I know I'm at a fantastic club who will help me through it. "My target is to be ready to go for the first day of pre-season, doing what the rest of the boys can do. "I'm confident it won't be any longer than that and that's what's keeping me going."